I recently got a tattoo. A binary tattoo in fact, which is the origin of my company’s name. Before taking the leap, I thought about my tattoo. A lot. I thought about where it would go and what it would say. I wore temporary tattoos for a month trying to pinpoint the exact location where I wanted it. I thought about who would be able to see it and how they would judge me. I thought about how many women of the next generation have multiple tattoos, so this would not single me out as it may have 10 years ago. If I worked with older people or more conservative people, would a tattoo change their opinion of me? I am a big fan of the Dr Seuss quote: “Those who mind don’t matter, and those who matter don’t mind.” But the truth is that sometimes, those that mind DO matter because they in some way influence your career, your education or your potential. Why did I put so much effort into a tattoo? Because it is permanent. It is a piece of me that I now share with the world. Can I hide it so that only my friends see it? Sure. Can I one day remove it? Yes, but at some pain, effort and cost. So why is the internet different? 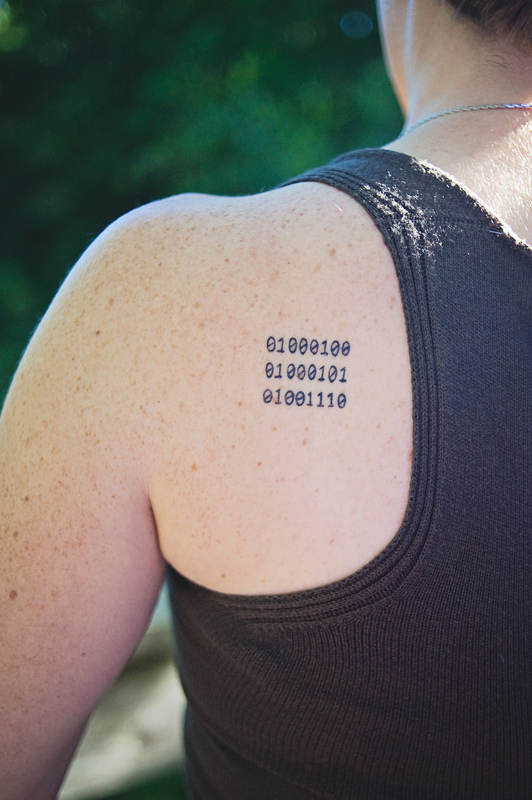 Every day, most people add to their own binary tattoo. They post pictures, tweets and status updates. They make opinionated comments online under articles. They blog about every detail of their lives. In some cases, their tattoos are hidden so a future potential employer may not see them at the interview. In other cases, they are tattooed on their foreheads. Don’t get me wrong, I love the social connections we can now make online. But how much are people considering how they are defining their tattoo? What is their tattoo? Where is it? Who can see it? And what does it say about them? I am not trying to scare you. Well, maybe just a little bit. But only in so much as to make you aware of the consequences of your online actions. Decide how you want to define your digital identity and then keep that in mind as you navigate the online world. If you are a parent, your concern might be for your child who cannot comprehend the long-term impact of their posts. Are you are unsure about how to do that? Wondering how to manage what is made public and what is kept private? Wondering what sites you should use and which to avoid? Most people will say YES. That’s why I started Binary Tattoo. One morning, it dawned on me that I am fortunate to have a strong technical understanding of software, where most people do not. And, even if they do, who has time to read the pages and pages of settings as well as the terms and conditions on each site. I wanted to find a way to simplify it, and teach people the basics so that they had at least heard of the website that their child spends 20 hours a week on. I also wanted to make people aware of the potential long-term impacts of posting information online. For a quick list of internet usage guidelines, please visit my Tips page where Binary Tat Cat says Don’t Do That! For updates and news on social network settings via your favourite network, please follow us using the links at the bottom of the page. Join our mailing list to get future blogs on topics such as privacy settings, tagging, terms & conditions and internet trending. Or visit my Services page for a full list of ways that I might help you. In the online world, knowledge is the best safety net you can get.